New York, From a Balloon. Pictorial Map of New York and Vicinity, Showing the Suburban Town, and Railroad and Water Communications. In studying this pictorial map the spectator is supposed to be stationed somewhere in mid air above Fort Hamilton, at the outlet of the [Verrazano] Narrows, from which convenient height he can cast his eye of all the century lying with a radius of eighteen miles of New York. In the center he will see the great metropolis, with its busy marts and wharves, its splendid Park (Central Park) and the surrounding islands. On the right, the city of Brooklyn, and the town lying eastward as far as Jamaica and Hempstead, and northward as far as New Rochelle, with the railroads that make them suburbs of New York, and the islands and headlands of the Sound. On the left he will see Staten Island, with its picturesque villas, Jersey City, Newark, and all the pleasant suburban villages and towns of New Jersey as far south as Perth Amboy, westward to West Orange, and northward to Caldwell and Paterson. Following the course of the Hudson, he will see all the towns and places of interest on the banks between New York and Yonkers, which can be reached either by railroad or by the various lines of steamboats that, during the spring, summer and autumn month, enliven the surface of that river. Some of the most pleasant excursions that can be made are connected with places of picturesque or historic interest along these shores. 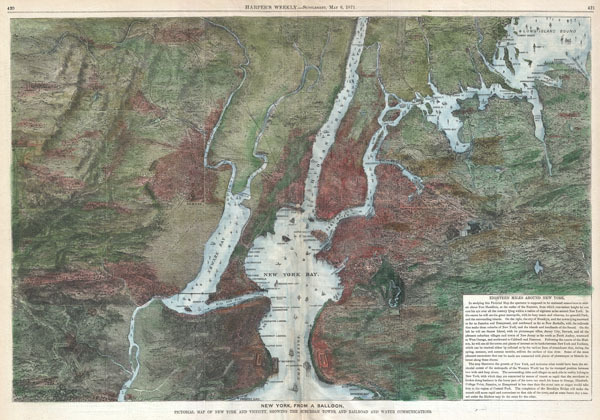 The map illustrates the growth of New York, and indicates what would have been the territorial extent of the metropolis of the Western World but for its cramped position between two wide and deep rivers. The surrounding cities and villages on each side in reality belong to New York, with which they are connected by means of transit so rapid that the merchant or broker doing business in the lower part of the town can rich his house in Orange, Elizabeth, College Point, Jamaica, or Hempstead in less time that the street cars or stages would take him to the region of Central Park. The completion of the Brooklyn Bridge will make the transit still more rapid and convenient on that side of the town, and at some future day a tunnel under the Hudson may do the same for the other. Harper's Weekly. --Supplement, May 6, 1871. Very good condition. Original centerfold. On newsprint. Text on verso.